White Paper Abstract: The continuous coordinated patient care at the heart of the patient-centered medical home (PCMH) has been shown to lower costs while improving healthcare outcomes. And now, according to the sixth annual HINtelligence Report, the rise in medical home starts over the last six years can also be linked to a steady climb in patient satisfaction. The Healthcare Intelligence Network conducted the survey, the sixth in the annual series, to uncover and keep track of key trends related to the patient-centered medical home. 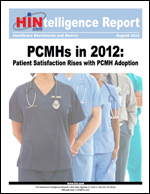 The 2012 survey data contains detailed metrics provided by 95 healthcare companies who completed the sixth annual survey. This HINtelligence Report provides data highlights on medical home adoption, staffing, technologies, reimbursement and ROI, as well as a look back at medical home metrics from 2006 to present. Customized reports, including benchmark results by industry sector, are available upon request.